Sophomore guard Kiki McIntyre (2) drives the lane before converting two of her game-high 18 points. Sophomore guard/forward Caroline Klemm (12) fights off a defender and drives the ball to the basket. The Needham High girls varsity basketball team entered its contest against Brookline on Friday night as winners of four straight. They had held their opposition to less than 30 points in three of their last four games. 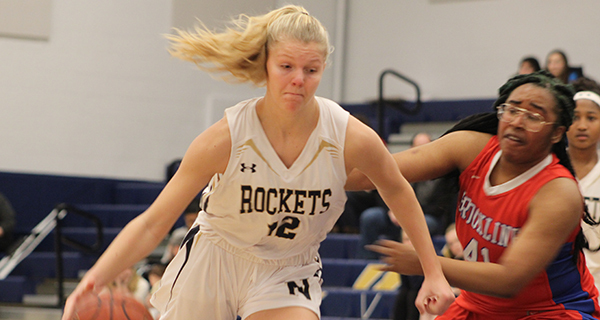 Behind a game-high 18 points by junior point guard Kiki McIntyre, the Lady-Rockets (9-3, 6-2), cruised to a 50-29 victory for their fifth straight win. Sophomore guard/forward Caroline Klemm also finished in double figures for Needham with 14 points. 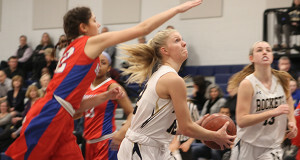 Needham began the game on an 11-0 run that featured a pair of layups by Klemm and a three-pointer by senior captain and point guard Marianna Jantzen (seven points). Brookline called a timeout to regroup and quickly cut into the deficit to 11-6. Layups by sophomore guard Madison Shaker and junior forward Jenna Petronio pushed Needham’s lead to 15-6 at the end of the first quarter. Senior captain/guard Marianna Jantzen (3) goes up for a layup. Senior captain and forward Julia Evans began the second quarter with a bang, finishing off a strong drive into the lane with a layup-and-one. 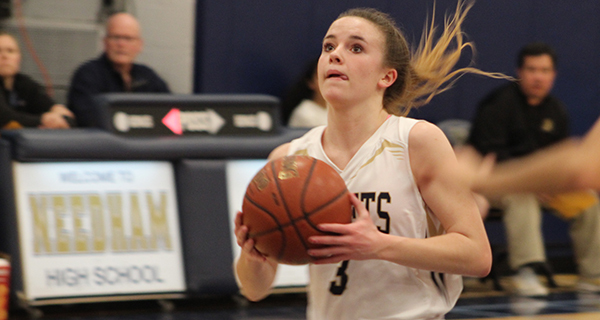 The three-point play by Evans began a 10-0 Needham run that extended the Rockets lead to 25-6. Brookline cut the deficit to 27-12, but a layup at the buzzer by freshman guard Lucy Dorion pushed the lead to 29-12 at halftime. Just like they had the previous two quarters, Needham began the second half on an 8-0 run to extend their lead to 37-12. However, Brookline responded back with an 11-2 run to make it a 39-23 game at the end of three. Needham hunkered down and hammered the nail into the coffin with an 11-4 run to begin the fourth quarter, extending the lead to 50-27. Marianna Jantzen displayed her toughness by wearing a pair of rugged elbows down the stretch that were not called, but more importantly, the Rockets emerged victoriously with the convincing 21-point victory. Caroline Klemm (12) powers her way to the rim and converts a layup. The Lady-Rockets will return to action on February 1 at home against Weymouth.